With all their faith and all their waiting… can you believe they missed it??? When it finally happened and Jesus was born, they didn’t believe that He could possibly be the Christ. You see, He did not fulfill the popular expectation of the Messiah at all. He was humble not boastful. He was a servant to others not bossy at all. On the outside, He was a man of few means, not a man of extravagant wealth. He was a lover and not a fighter. Nope, this wasn’t the Christ they expected at all and as a result of their incorrect expectation… they missed it completely. I have often asked myself how I will know when Jesus returns. I wonder if I will accidentally miss it or not believe when the time comes. But then I realize I am fortunate to have the Bible to direct me and assure me that I will not miss it. It's very clear in there, there will be no way for me to miss it… and I have to be honest… I can’t wait! I think we as people walk around with all sorts of expectations and we don’t even realize it. For example, if you’re in a really good mood, you might choose to say hi to a stranger at the store. But just because you said hi doesn’t mean they are going to say hi back. In fact, they might even give you the finger depending on what kind of mood they are in. It's amazing how quickly your good mood turns sour when you do something nice (like saying hi) and the same niceness isn’t reciprocated. Why is that? It's because we have the expectation that just because we offer ourselves in kindness, that others should do the same. We expect to be respected… and in our selfishness, we also somehow think everything is about us. If someone doesn’t say hi, it’s taken very personally and we wonder what we did wrong. I have gotten better at not over-expecting or under-expecting (which is just as dangerous) but I still have a lot to learn. One of the ways I practice having a zero expectation walk of life is to say hi to everyone I come across… say hi and expect nothing in return. It’s a very small gesture but has helped me a lot. Some people smile at me, some people growl at me, some people look at me like I’m a weirdo and some people just jump right into a lovely conversation. No matter what happens though, I know I am doing it because I want to. I am doing it because it’s a little way I can shine a tiny glimmer of Jesus into other people’s world. They don’t have to accept it… that is their choice. And… if they don’t, I know it’s not my fault at all. I never know what someone else’s battle may be, but it surely is not about me saying hi to them. Recently I’ve had some expectations dashed… and it has really hurt. I do a lot of work with people in recovery and it gets messy sometimes. One of my expectations in this area is that people who come to me for help, really honestly want help. That seems like a reasonable expectation, right? Well, I think I’ve learned that having a zero expectation policy here is much healthier because in reality… some of the people who ask for help are only doing it because they know they are supposed to want help while in reality… they are not fully ready or willing to make changes. Another expectation I realize I must change is the belief that the people I work with in recovery will respect our relationship enough not to turn on me and blame me for things I had nothing to do with. My partner in recovery leadership told me that this is pretty normal stuff… that hurt people, hurt people… and they lie and make stuff up to cover their own butts. They need someone to blame for their failures or incorrect behavior and the one who was trying to help, the one who knows the truth is usually the easiest target. I know he is right, and I know I’ll get better at this as I adjust my expectations and tighten up my boundaries when working with new people, but I have to admit… it is scary to throw my trust out at people who I know might screw me over because they are not ready. In the last month, this has been so real and scary to me that I have deeply considered walking away from my God given purpose of helping others in need of recovery. I’m not going to quit though, God has assured me this is spiritual warfare. The devil doesn’t want me to to continue because through me following God’s will, the devil will lose some very faithful followers. My head knows I can’t quit and that I won’t quit… but my heart questions whether I can handle the pain. Can I really keep trusting the untrustworthy hoping they will see that God hasn’t given up on them, while taking the chance they will turn around and pierce another piece of my heart? Can I do it? I ask, what would Jesus do? Would He turn away from what God has asked Him to do just because He was scared of being hurt? If you recall the night He was arrested, He went to His Father in prayer and asked Him if there was any other way… He said, “My soul is overwhelmed with sorrow to the point of death,” (Mark 14:34) Then He said, “Abba, Father, everything is possible for you...Yet not what I will, but what you want.” (Mark 14:36). He went on from there to suffer a torturous, painful, horrible death… for all of us. For… me. Jesus didn't turn away from what God wanted of Him, and He knew it was gonna hurt real bad. A wise friend of mine told me that in the end, all we have is trust. If we let this cynical world steal our trust from us, we are only punishing ourselves (thank you wise friend). Of course, trust should be used with intelligence, with expectations in check and proper boundaries in place. And then comes faith… faith in a God who is bigger than all of it. Yesterday, my heart was heavy with grief and I had been crying most the day. God felt really far away and I was questioning what He wanted from me. It hasn’t been my best week. I had to put my dog to sleep, both of our cars broke down, ridiculous untrue accusations coupled with unkind emails, difficult personal boundary adjustments, and to top it off… my grandmother died. Having a heavy heart… well that doesn’t even begin to describe my feelings at the time. But I had a party I needed to go to for Celebrate Recovery and I decided to try and do my best with what was ahead of me. I was in the car trying to merge onto the highway and for some reason, no one would let me into traffic. It was tricky and for the first time in a long time I really struggled to get in the lane I needed to be in on the road. Finally I was there and took a deep breath. I looked ahead to the car in front of me and the plate said, “PVB 123” I wondered if God was speaking to me… had the cars not let me in because God needed me to make my way behind this particular car? God-incidence??? I called my husband and asked him to read Proverbs 1:23 to me and here is what it said, “Listen to my strong words! See, I will pour out my spirit on you. I will make my words known to you.” I was in awe… God was there… He was going to take good care of me and I needed to just relax and let Him show me His will… it would come. I have felt a little more at ease with God’s presence since then, but still very troubled about having been accused unkindly of something untrue while trying to help someone in recovery and I've chosen not to stand up for myself because I hold others anonymity very highly. It just hurt my heart. This morning at breakfast my husband suggested maybe I needed to read the license plate a little differently… Proverbs 12:3. I looked it up and here is what it said, “A man will not stand by doing what is wrong, but the root of those who are right with God will never be moved.” The weight on my shoulders began to lift and by the time we returned from church... I was finally at peace. Knowing Proverbs 1:23 and Proverbs 12:3 is out there and that they are the word of God written for me, I can say loudly, “Yes Lord, I can do what You ask of me, whatever it is!” And with the help of a few really good real friends, my sponsor and an a-number-one Christian therapist, I will get better at balancing the proper expectations and boundaries that are so needed in what I was made for. Hey devil… you can expect to see me keep on going! And I expect that my heart will ache from time to time... but the joy in the end will be worth every single expectant tear. I'm not going to miss out on my calling or my relationship with Christ just because it's not quite what I expected. It has been a very sad day for me. I made the decision that it was time for my little doggy, Tori, to go meet her maker. It was one of the toughest things I have ever done in my life and as I sit here now, I am relieved it is over. I am not relieved she is gone, but I’m glad that I don’t have to ponder the subject of “when” for another moment. I was really hoping she would just drift off on her own one night but… that would have been too simple, especially for a very complex, neurotic dog like Tori. I joke that she was the most expensive dog ever purchased. It’s not that she cost that much… it’s that I purchased her on a credit card with 10% interest and then didn’t pay it off for over 10 years. With compounded interest, late and over the limit fees the little American Eskimo Spitz puppy was by far the most expensive dog in the world. I may not have been very responsible with my money back then (obviously) but taking care of her taught me a lot about responsibility in general. I wasn’t always very good at that responsibility, but I did my best. I am regretful of several poor decisions I made as her owner. Sometimes the men in my life were more important than she was. Sometimes I didn’t do a good enough job at protecting her from herself (not putting the trash places she couldn’t get to it). I didn’t give her enough discipline and as a result, she was really hard to control later in life… especially after Brett was born. I yelled at her for things that weren’t really her fault… and I left her behind at the kennel for most of the big events of my life. I am disappointed with her that my son didn’t have a dog that loved to play with him and romp around in the back yard playing ball. Instead, I had to protect my child from the unpredictable nipping and bite of a very jealous little animal. But that was my fault… I didn’t do the kind of research I should have before purchasing the little puppy. I bought her based on cuteness… only to find out later that she was not a very baby friendly animal. Yes, I am disappointed that the birth of my child caused so much angst for little Tori… and for me. I am angry about all the things she destroyed through the years… oh my goodness! She could chew through anything. One day I awoke to a big hole in the drywall of my bedroom wall. She ate clothing, shoes, furniture, books… basically anything she could get to. I’m also angry that she barked so dang much. It was so annoying, especially toward the end of her life. She was deaf so she barked even louder then normal. Her only joy in life in the final days was to bark for treats – and she did it ALL DAY LONG. She was tenacious too… barked until she got what she wanted. It would infuriate me. But, mostly I am thankful. She was my one and only friend for many, many lonely years. She saw me at my worst so many times, in fact, she was the only one who knew the real alcoholic Wendy at her worst. I never hid my behavior from her…and she just kept on loving me. She would lick my tears and entertain me endlessly. She helped my husband propose to me… he tied the ring around her neck and I am so thankful I kept the ribbon he used. She provided me with many good memories through the years… the way she rode in a milk crate in the back of my two-seater convertible back in my early twenties. The time she absolutely refused to forget about the hotdogs a neighbor tossed over their balcony edge… she knew they were there and she was gonna get them by golly. That went on for days! When I lived in Maryland, there were some huskies that lived behind us. The firehouse was close by and when the alarm went off those huskies would howl at it. Tori wasn't a very good howler but she sure did try to join in. She would stand up and make sure I wasn't watching her (as if embarrassed) then slowly begin to try to howl. Her voice would crack and she sounded silly but I'd just pretend I didn't hear her just so she'd keep doing it. We took her with us on all our family reunion Outer Banks trips and boy did she like running on the beach and digging in the sand. And what about all the nights she kept me safe from the boogey man when I lived alone and then later, when my husband was out of town. I can see her running happy and free in the pasture and yard at my parent’s farm in Virginia. She only got zapped by the electric fence once or twice before learning not to go near that. And just his past Thanksgiving… oh the fun we had with her trying to keep her out of the kitchen… you had to be there… it was hilarious. She was a good little dog… even though I failed her in many ways. I’ve said she was annoying to many people, I’ve jokingly tried to give her away more times than I can count but all of her horrible habits were of my own making… my fault…. and for that I say to her… I am sorry. I am also sorry that I, the hand that had fed you for years, kept you safe, happy, protected and warm was the hand that brought about your final moments on earth. For that… I am truly sorry. I hope you will forgive me. I held her in my arms, looked in her eyes as she slipped away… I told her I loved her and how much she meant to me and then I asked God to take good care of her. She was His long before she was mine, so I know He will. Bye little Tori… I love you and will miss you and your jingle jang le. This morning I was sitting on the floor in my kitchen playing a refrigerator game with my son. He was tossing magnets at the refrigerator door to see how many of them he could make stick. It turned out to be a lot more difficult than he imagined. It’s a basic law of attraction: magnet… refrigerator… shouldn’t they all stick easily on the first toss? Brett is the kind of boy who likes to do easy things. He tends to shy away from things that he can’t do perfectly the first time he tries. As with all of us, he really enjoys success and avoids failure at nearly any cost. I am trying to teach him that failure is a very important part of life. When things are difficult for us, we must keep trying, learn from our mistakes and practice practice practice. If we keep it up, we eventually will have success. I read a book called “Failing Forward” and it changed my attitude about failure. I realized that failure is not something we can avoid, unless we want to do nothing at all. It’s not a bad thing… it’s a necessary stepping stone to greatness. So there we were sitting on the kitchen floor (which I noticed was really dirty… to-do add on: mop kitchen floor), he was tossing magnets toward the refrigerator in a game that should have been easy but ended up being a game of chance. Only about ¼ of the magnets stuck and the rest fell to the floor. This quote makes me chuckle because of its oxy-moronish statement. I see myself (the new creation Wendy, not the old dead Wendy) as a fairly tolerant person. I love people, especially people who are screwed up because I myself am quite a bit screwed up. I feel like God has gifted me with a vision of people that is deeper than their problems. I see beauty and hope in messed up lives… I see grand opportunity for God to come alive in a real and tangible way. So, I like to think of myself as very tolerant. But… as I sat on the floor looking up at this reminder, I realized there are few people in my life that I have become a person who, instead of embracing them as beautiful screwed up people who carry a promise of hope but just haven’t fully gotten there yet, I have become a person who silently yells, “Intolerance will not be tolerated!” at them. There is one person in particular that I have really been struggling with… and I have to say resentment has built up a wall that has blocked be from seeing their God molded beauty. Part of it is that this person is almost EXACTLY LIKE ME. For some reason, it’s harder for me to tolerate their behavior because it is so much like mine used to be before I fully gave my life to Jesus. A very wise friend of mine suggested that perhaps my specific intolerance of this person was more a reflection of how I felt about myself… perhaps I have not fully forgiven myself for my poor behavior in the past. Wow, the insight the Spirit gives others to tell us our truth is amazing when we open up and become transparent with the right people. Back to the magnets, as I watched little Brett’s game continue, I was completely surprised at how easy going he was about his failure rate, again only about a quarter of the magnets were sticking. Instead of whining and becoming intolerant of the ones that fell to the floor, he rejoiced in the ones that stuck. I wondered if maybe my lessons of continuing to try had finally begun to stick with him. But what he did next really taught me a lesson. When all the magnets had been tossed… he picked up the ones that had fallen to the floor and “failed” him and instead of giving up on them or throwing them away, he gave them a second chance. He began tossing them again. 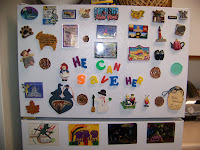 I think we are like magnets God is tossing at the refrigerator of salvation. A lot of times, the natural law of attraction just doesn’t work. Sometimes we turn ourselves the wrong way as we are flying through the air and when we get to the door… we don’t stick. But God doesn’t become whiny or intolerant of the ones that failed him, He doesn’t throw us away and give up on us. He rejoices in the ones that stick and then… He very kindly picks up the ones that fell away and gives them another chance to stick. Lucky for us… He just keeps trying again, rejoicing in the ones that stick and then giving the ones that fall away another chance… over and over and over. It is amazing to me how my 4 year old child can teach me such valuable lessons in life. Of course, he has no idea but wow… the wisdom of a child! I will take the advice of my wise friend and look a little deeper at my own self-forgiveness. I will try to stop passing right over the poster, “Intolerance Will Not Be Tolerated” and take time to actually SEE it. And, I will hug my child with a silent thank you for reminding me that God never gives up on us, no matter who we are or how many times we fall to the floor. I want to be more like that. 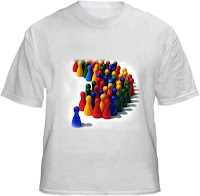 Christian Leadership Is Like a T-Shirt... Really, It Is! A few weeks ago my husband said to me, “Wow, you sure do have a lot of Jesus shirts!” Yes, I do. I’ve written a few different articles concerning my t-shirts. Check out June’s articles “Blending In” and “Responsibility… An Addendum to a T-Shirt” and October’s “Out of Propane … Again.” I’m a big fan of Jesus shirts, not so much because I think I’m making people love Him by seeing my shirt, but more because it’s a way I can profess my faith without saying a word. I can show Jesus my devotion to Him and show I am not ashamed to profess it. It also has created a new way of thinking for me… a way of being more responsible for my actions and to not be a bad example for Christ. The impact of Jesus shirts has been life changing for me. Choice Four: You can choose to wear the T-shirt and walk around willy-nilly without a care in the world. You’re flipping people off, cursing like a dude that just fell off a navy boat, getting loaded at the bar… you’ve forgotten about the shirt completely or maybe you just don’t care one way or another. Perhaps the t-shirt is fashionable, or maybe it makes you feel like you are part of something, maybe it’s just comfortable, maybe it makes you feel important… who knows… but you can choose to put it on and wear it just like any other shirt in your closet. Choice Five: You can choose to wear the shirt and take the responsibility seriously. When you put it on, you say to yourself “I am going to do my best to be an example that makes God shine. I am going to walk as closely to Jesus as possible today.” Okay, so you might mess up but refer back to the parenthetical at the end of Choice Three… get over yourself, God can fix ANYTHING. The amazing thing with this choice is that if you work on this consciously, in time what will happen is you will not need to prep yourself each time you put the shirt on, and maybe just maybe you will unconsciously become a better disciple of Christ than you ever have been before no matter what shirt you have on… and what could possibly be wrong with that? Nothing… it’s awesome. I have seen this happen in my own life. And yes, I do screw up. But… I keep putting the t-shirt on and keep doing my best. Isn’t that what being a Christian is really about… having the shirt on every single day? So now, what the heck does the t-shirt have to do with Christian leadership??? A lot really… it’s just we don’t think of it this way. Choice One: You can choose to not put yourself in a position to ever be asked to step forward for Christ. Perhaps that means not going to church at all, maybe it’s just going on Easter and Christmas. Maybe it’s regular attendance but out the door you run as soon as it’s over. After all, you don’t want anyone to approach you and actually ask you to do anything for the church. If they did, you’d either have to make up some lame excuse about how busy you are or you’d have to say yes just so people don’t think you’re a bad person. Then you end up serving God with a bad attitude. He LOVES that (sarcasm). Choice Three: You’ve been attending regularly for a long time, you’ve even officially joined the church and it feels good. You have “purchased” a tiny corner of the building by committing your tithes. Someone steps up and directly asks you, “Would you be willing to lead a new team for us? I think you have the skills and background to do a great job. This ministry could be incredible and reach lots of people… will you think about it?” You are so honored and you go home with a smile on your face. “Wow… they thought of me! I must be doing something right, I have it all together! They know I love God and see what a good person I am.” Suddenly, the honor starts to turn on you…. And fear steps in… “But I don’t have it all together… and what if they find out? What if they find out about my bad habits? Will they kick me out of the church?” Then the Spirit steps in… “But God obviously brought this to me for a reason, maybe He is asking me to step up. Maybe with His help I can make some changes within myself that I have been putting off for a long time.” Enter Satan…”Who do you think you are? You can’t change. You are just a worthless sinner and you have no business leading anyone in anything. They will laugh at you, they will mock you, you will fail… you’re better off letting someone more qualified than you take this.” You call the person who asked you to lead this new team or ministry and you politely decline. Part of you is ashamed because the voice of the Spirit told you ever so quietly that He wanted you to do this and that perhaps it was time to makes some changes in your life. The other part of you is relieved. You can go on just the way you’ve always been, doing the things you want to do, not worrying about if people find out or what people will think of you. Whether you realize it or not, that relief brings more guilt… and shame. Choice Four: You agree to head up the new ministry. You are ready to go and proud that you were chosen. This is a point of ego for you “I am a leader, people look up to me, I am good.” Deep inside you know that your position as a leader means that you should probably not act out in certain ways but, who do these church people think you are, Jesus? “I mean, I need to live my life and be who I am.” You have chosen to lead but you walk around willy-nilly without a care in the world. You’re flipping people off, cursing like a dude that just fell off a navy boat, getting loaded at the bar. When you are outside of your ministry, you’ve forgotten about your church responsibility completely or maybe you just don’t care one way or another. Perhaps to you leadership is fashionable, or maybe it makes you feel like you are part of something, maybe it makes you feel important… who knows… but you can choose to take on the role of leader in Christ but segment your life so that you don’t have to make any changes that reflect your choice to lead others to be closer to Christ. Sadly, I believe this is where most people find themselves. I would love to be wrong. Choice Five: You can choose to lead the ministry and take the responsibility very seriously. When you wake up in the morning of a ministry responsibility, you say to yourself “I am going to do my best to be an example that makes God shine. I am going to walk as closely to Jesus as possible today.” You recognize that you will never be perfect, you will make mistakes, you will need to make apologies but your faith is strong and you know without doubt… God can fix ANYTHING. You step out just a little bit further and realize that the way you act in public, while at work, while at the coffee shop, while waiting in line at the grocery store is also a reflection of your ministry. What if someone from church saw you flipping off the car next to you? Because you are a leader, would they then think it was okay to do such things? Or would they go the other way and make a decision to NOT be like you? You put yourself in God’s hands humbly and ask Him to do His best work with you, molding you into the person He made you to be. You allow your ministry to bleed into your entire life. The changes you have been waiting to make… you jump off and do it with the help of God. Eventually with this attitude you will unconsciously become a better disciple of Christ than you ever have been before no matter where you are or what you are doing… and what could possibly be wrong with that? Nothing… it’s awesome. I have seen this happen in my own life. And yes, I do screw up. But… I keep trying and keep doing my best. Isn’t that what being a Christian is really about… leading people towards Christ every single day? Are you still wondering what a T-shirt and Church Leadership have in common? Well, here’s a big idea for you to try to swallow. Forget about t-shirts and specific ministry leadership for a moment. Let’s go really basic. Think about your allegiance to Christ. Do you call yourself a Christian? Do you call yourself a Christ follower? Well, the choice to be a Christian, a Christ follower, is in and of itself a daily leadership position. If you are a person who calls yourself Christian… I urge you to take it very seriously in all facets of your life. It is a matter of life and death; few and many, narrow and wide. If you have made the decision to lead within the body of God’s church, I also urge you to take it very seriously in all facets of your life. It’s not an easy thing to do. In fact it takes a lot of discipline and prayer. But you have peoples’ lives in your hands and in addition you have made a “contract” with God to aid his ministry one soul at a time. If you can not take this seriously, don’t accept the job. None of us are perfect, and one of the best things a leader can do is to be authentic, able and willing to say, “I screwed up, I’m sorry… I will try my best to do better next time.” I have very recently had to do this very thing. I was embarrassed, but the outcome was incredible. I built more trust and credibility with my people… and I was told that the fact I could admit my failure proved that I am, in fact, a good leader. I will end with this quote, “Nobody likes to be led, but everyone loves to be led well.” Lead well my friends.